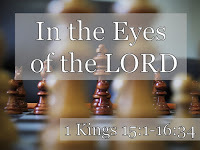 [Matt's Messages] "In the Eyes of the LORD"
Our series is called “The King of Kings in the Books of Kings,” and the story has recently gotten pretty complex, complicated, and fairly weird. Last week, the story involved a false prophet who turned true and a true prophet who disobeyed God, even though he knew better. It had a miracle of a splitting altar, a shriveled non-retractable hand, and a lion that kills on God’s command and then stands at attention. Exciting stuff, huh? Kind of strange. This week’s portion of scripture isn’t as strange, but it’s even more complicated. Because in the first 14 chapters, we’ve gone from one king over one kingdom to two kings over two kingdoms. 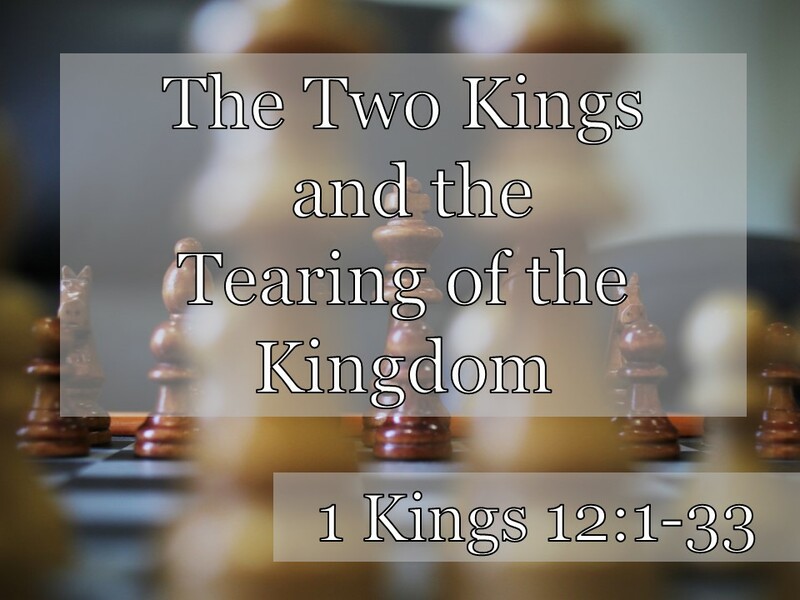 And now in just two chapters we’re going march through a parade of 8.5 kings over those two kingdoms, and their reigns overlap, two in one, six and half in the other. So it’s a little difficult to keep track of who is doing what when and where. We’re going to fly through about 45 years of history in just two short chapters. And not only is it complicated, it’s also a little bit boring. It’s repetitive. This is the part of the Books of Kings where it begins to feel like a broken record. If you don’t, you soon will. The author kind of gets into a rhythm. He tells us who the king is and when he began his reign. He tells us who the king is in the other kingdom when he begins his reign. He tells us how long the king was the king. He gives a fairly short summary of the king’s administration, and then he tells us that the king died. And then it’s all over again. And most of it is bad. That’s pretty good! And it sums up a great bulk of what we’re going to read this morning. It’s broken record, playing a sad sad song. But I picked a different title for today’s message based on a phrase that keeps getting repeated over and over and over again in these 2 chapters. It’s a phrase that’s been used before and will continue again and again and again throughout the rest of the Books of Kings. This is a phrase that keeps getting repeated over and over and over again in the summaries of how the king did, either good or bad. He did what was right in the eyes of the LORD. Or he did evil in the eyes of the LORD. Those are the two choices. The only two options. We’ve already heard that any king of God’s kingdom has just one job. They have many duties, but only one job. To walk with God leading their people to do the same. Well, these 8.5 kings are faced with that same test. And the question is do they do what is right or what is evil in the eyes of the LORD. Because it’s Yahweh’s eyes that truly matter. It’s LORD’s opinion that is truly important. What God thinks about something or someone is what is paramount. Yahweh is the standard of right and wrong, of good and bad. And He cares! He is watching. And we just meditated on those words for half an hour. This week still about that. We’ll see that again some more. But it’s also about the eyes of the LORD. His appraisal. His assessment. His opinion. Our story starts today in the southern kingdom of Judah after the death of King Rehoboam. That’s where we left off at the end of chapter 14. Today, we get the new king of Judah who is the son of King Rehoboam which makes him the grandson of whom? Solomon. And the great-grandson of King David. He might have even known his great grandfather. We don’t know. What we do know is that he did not last long as king. And that his name was Abijah. Chapter 15, verse 1. “In the eighteenth year of the reign of Jeroboam son of Nebat [up in the north], Abijah [or Abijam, another way of saying it] became king of Judah, and he reigned in Jerusalem three years. His mother's name was Maacah daughter of Abishalom. Do you see how the pattern has already begun? When he began, who is king in the other kingdom, what his name is, how long he reigned, and a summary of administration. Is he thumbs up or thumbs down? He’s clearly thumbs down. And the short reign would point towards that. Though we’ll see that some bad kings get terribly long reigns. So, you might guess that the kingdom is going to be taken away from the family of David. Right? Three strikes, you’re out? Solomon failed. Rehoboam failed. Abijah failed. Oh! Even though these guys in the South were thumbs down, God was still gracious to them. And gave them more sons who would be king and kept Jerusalem strong. Because of God’s promises to David. Remember the David Covenant of 2 Samuel 7? The promises God make to David. Back in chapter 11 when Solomon was judged, the LORD said that he would keep a lamp burning in Jerusalem. And here it is. It’s God’s covenant faithfulness. Which David had also a measure of. V.5 again. #1. DOING WHAT IS RIGHT IN THE EYES OF THE LORD. That’s what God is looking for from these kings. And I don’t think it’s far off to say that’s what He wants from us, as well. Okay. Anybody know if Asa is thumbs up or thumbs down? In the eyes of the LORD? “In the twentieth year of Jeroboam king of Israel, Asa became king of Judah, and he reigned in Jerusalem forty-one years. His grandmother's name was Maacah daughter of Abishalom. Asa did what was right in the eyes of the LORD, as his father David had done. We’ve got a good guy on our hands! Where is Asa king, again? He’s in the South. Judah. And he did what was right in the eyes of the LORD. He was David-like. He even restored gold to the temple! He didn’t quite get rid of all of the false worship in Judah, but he seemed to really try. And his heart was fully committed. That’s what God is looking for. Is your heart fully committed to the LORD? One way you can tell is if you do hard things because they’re the right things. I think that verse 13 shows us just how committed Asa was. I mean he kicked his own grandmother out of the palace because she had set up an “repulsive” Asherah pole. She didn’t get the “family exception” to the rules. Asa is at least 1 and half thumbs up. He’s not perfect, but he’s faithful. He hates idolatry. He loves the one true God. He did his one job. Now, he wasn’t always wise. In fact, the book of Chronicles tells us a lot more about his mistakes. He had plenty. Compared to David he wasn’t that great. But compared to Jeroboam, he was amazing. And that’s where it counts. Are you doing hard things because they are the right things? Are you cleansing yourself of idols? Remember, in the eyes of the LORD, idols are (v.13) repulsive. I’m sure you don’t have Asherah poles, but what are you tempted to worship that is not God Himself? When it takes God’s place, it is repulsive to him. Abhorrent, detestable, repugnant. We need to be purging ourselves of those kind of idols. To doing right in the eyes of the Lord. Asa then took all the silver and gold that was left in the treasuries of the LORD's temple and of his own palace. He entrusted it to his officials and sent them to Ben-Hadad son of Tabrimmon, the son of Hezion, the king of Aram, who was ruling in Damascus. Ben-Hadad agreed with King Asa and sent the commanders of his forces against the towns of Israel. He conquered Ijon, Dan, Abel Beth Maacah and all Kinnereth in addition to Naphtali. When Baasha heard this, he stopped building Ramah and withdrew to Tirzah. Now, I want to get on to the other kings, but this shows us, I think, that Asa was not perfect. He made the mistake of trusting in Gentile kings and he lost money and territory in the bargain. And the book of Chronicles tells us more about what mistake he made. Now, we won’t return to the souther kingdom and their amusingly named king until the very last chapter of 1 Kings. Instead, we’re going to turn our focus for the next several chapters to the action in the northern kingdom of Israel. And unfortunately, the kings up there aren’t so very thumbs-up as Asa was. If you remember, the king of the northern kingdom was named Jeroboam. And he as two thumbs down. He set up false worship in his kingdom. He invented his own way of doing worship with golden calves in the north and the south, Dan and Bethel. And last week, the prophet had announced his downfall. And the downfall of his entire line. Remember that? Ahijah. The same prophet who had predicted his rise, prophesied of his fall and the death of his entire family. #2. DOING EVIL IN THE EYES OF THE LORD. “Baasha son of Ahijah of the house of Issachar plotted against him, and he struck him down at Gibbethon, a Philistine town, while Nadab and all Israel were besieging it. Baasha killed Nadab in the third year of Asa king of Judah and succeeded him as king. Sad isn’t it? And interesting. Abijah’s line continues because of David. Nadab’s line ends because of Jeroboam. Because they did evil in the eyes of the LORD. Those are the sins that Jeroboam had committed and had caused Israel to commit. And notice how God feels about it? He is provoked. You know we don’t like to think of God having feelings. Caring about things. But the Bible says that the LORD is a person. He cares about things. He cares about the right things! But He cares about them deeply. Including His glory. He is not happy if His glory goes to an idol. It provokes Him. Rightly! Justly. Perfectly. But dangerously. In the eyes of the LORD, idolatry is not just repulsive, it’s angering. It’s provoking. It arouses God’s wrath. And Nadab and his family felt that wrath. V.31. “As for the other events of Nadab's reign, and all he did, are they not written in the book of the annals of the kings of Israel? There was war between Asa and Baasha king of Israel throughout their reigns. He wasn’t related to Jeroboam! He had killed Jeroboam’s family! But he didn’t kill Jeroboam’s worship system. So it’s all over again. See what I mean about a broken record playing a sad song on skip? Chapter 16, verse 1. “Then the word of the LORD came to Jehu son of Hanani against Baasha [a new prophet]: ‘I lifted you up from the dust and made you leader of my people Israel, but you walked in the ways of Jeroboam and caused my people Israel to sin and to provoke me to anger by their sins. He had been sinning even as he was accomplishing the will of the LORD. Do you see how this a broken record? New king, old sins, dies. New king, old sins, dies. Lather, Rinse. Repeat. And I think that God is saying something in that. I think that He’s saying that idolatry and sin is basically boring. Sin promises all kind of exciting stuff, but it never really delivers. The really exciting, awesome parts of this book happen when godliness is popping. We’ll see that in a few weeks with the prophet Elijah. But this stuff with bad kings doing bad things? It’s boring. Idolatry never lives up to its promises. The end of that road is always death. Same old, same old death. V.8 “In the twenty-sixth year of Asa king of Judah, Elah son of Baasha became king of Israel, and he reigned in Tirzah two years. Zimri, one of his officials, who had command of half his chariots, plotted against him. Elah was in Tirzah at the time, getting drunk in the home of Arza, the man in charge of the palace at Tirzah. Zimri came in, struck him down and killed him in the twenty-seventh year of Asa king of Judah. Then he succeeded him as king. As soon as he began to reign and was seated on the throne, he killed off Baasha's whole family. He did not spare a single male, whether relative or friend. So Zimri destroyed the whole family of Baasha, in accordance with the word of the LORD spoken against Baasha through the prophet Jehu–because of all the sins Baasha and his son Elah had committed and had caused Israel to commit, so that they provoked the LORD, the God of Israel, to anger by their worthless idols. In the eyes of the LORD, idols are not just repulsive and provoking, they are also worthless. Is that how we see idols? Idols present themselves as valuable. If you worship me, I’ll give you this. And more of this! Popularity? Money? Possessions? Productivity? Entertainment? Achievement? Pleasure? Or the things that give you those things? What do they promise you? They promise the world, but they don’t deliver. They are worthless. ...In the eyes of the LORD. V.14 “As for the other events of Elah's reign, and all he did, are they not written in the book of the annals of the kings of Israel? In the twenty-seventh year of Asa king of Judah, Zimri reigned in Tirzah seven days. [Seven days. That’s all he made it. He assassinated the king to become the king and it lasted for a whole week.] The army was encamped near Gibbethon, a Philistine town. Then Omri and all the Israelites with him withdrew from Gibbethon and laid siege to Tirzah. When Zimri [the king] saw that the city was taken, he went into the citadel of the royal palace and set the palace on fire around him [suicide]. So he died, because of the sins he had committed, doing evil in the eyes of the LORD and walking in the ways of Jeroboam and in the sin he had committed and had caused Israel to commit. Then the people of Israel were split into two factions; half supported Tibni son of Ginath for king, and the other half supported Omri. [That’s why I said “8.5" kings today. Because for a while there were 2 rival kings in the north.] But Omri's followers proved stronger than those of Tibni son of Ginath. So Tibni died and Omri became king. Omri was two thumbs down. He was actually 3 thumbs down. Nadab was two thumbs down. Baasha was two thumbs down. Elah was two thumbs down. Zimri was two thumbs down. Tibni if he was truly a king was two thumbs down. What’s fascinating to me is that by most worldly markers, Omri was a good leader. He built a thriving kingdom. We know this because of history. The history of the kingdoms around Israel tell us that Omri was really successful at building a booming kingdom. He was kind of like David. He fought and won wars. He built a new capital. He established good relationships with his neighbors. For many decades after he died, they called Israel the land of Omri. It’s in the history books! But in the eyes of the LORD, Omri was a failure. Isn’t that a cautionary tale? That we could have the world by the tail, but miss what is most important. It doesn’t matter what the world thinks. It doesn’t matter what your reputation is. What matters is what God thinks. Omri was very successful and did evil in the eyes of the LORD. And that’s the verdict of his life that stands. One last king to introduce today. He’ll actually be the king from here to the end of the first book. “In the thirty-eighth year of Asa king of Judah, Ahab son of Omri became king of Israel, and he reigned in Samaria over Israel twenty-two years. Ahab son of Omri did more evil in the eyes of the LORD than any of those before him. He not only considered it trivial to commit the sins of Jeroboam son of Nebat, but he also married Jezebel daughter of Ethbaal king of the Sidonians, and began to serve Baal and worship him. He set up an altar for Baal in the temple of Baal that he built in Samaria. This guy is the worst so far. He’s like 4 thumbs down! Doing evil in the eyes of the LORD. More evil than anyone before him. It’s like it was a contest. Oh, that’s nothing. Get out of the way. See how bad I can be! Outdoing each other with evil. Not just a golden calf or two like Jeroboam. That’s nothing! Child’s play. Let’s get some fertility gods in here. Let’s get some Baal worship going down. Let’s marry a Baal priestess princess! You thought those other idols were repulsive? I’ll get one of those Asherah poles, too. And I’ll authorize a guy to rebuild Jericho. Never mind that God said that you shouldn’t do it. And if you did, you’d lose your sons. And you know that there will be consequences. It may not be immediate. I’m sure that he felt like he was getting away with it. That’s what we do when we’re sinning and running. And He is not neutral. He is provoked. His anger is stoked. These repulsive, worthless idols have provoked Him to anger. And He will do something about it. What is the application of all this? God cares how we live. God wants our whole hearts. He wants us to have a heart for His heart. Like David. God wants us to put away our idols and worship Him alone. He wants us to see idols the way He sees them: repulsive and worthless and boring and destructive. And angering. And He wants us to see that He is in control of history. This may all look like it’s out sliding downward out of control, but He’s actually managing every step of the descent. He’s maintaining a lamp in Judah because of David but taking Israel down because of Jeroboam. And what’s most important is what’s going on IN HIS EYES. It’s a broken record for a reason. Because we need to hear the lesson of this sad song. Doing right? Or doing evil? Where do you need to make a 180 degree turn? You know we’ve said this again and again, but when the kings are at their best, they remind us of Jesus. Asa reminds us of Jesus. He did what was right in the eyes of His father 100% of the time. But when these kings are at their worst, and we’re starting to get to the bottom of the bucket, they remind us why we need Jesus. Because, left to ourselves, we do evil in the eyes of the LORD. And we need a Savior to come and rescue us. These two broken record chapters show us our desperate need for King Jesus to save us. And praise the Lord; that’s what He came to do. 1. Review. It’s been a while since we met to discuss the messages in this series on the Books of Kings. What have you been learning the last several weeks? What has really stood out to you? 2. Read 1 Kings 15:1-24. Why is the phrase “in the eyes of the LORD” so important in this book? Why should it be important to you and me today? 3. Which kings are examples of doing what is right in the eyes of the LORD? What did they do that was so good? What can we learn from their examples? 4. 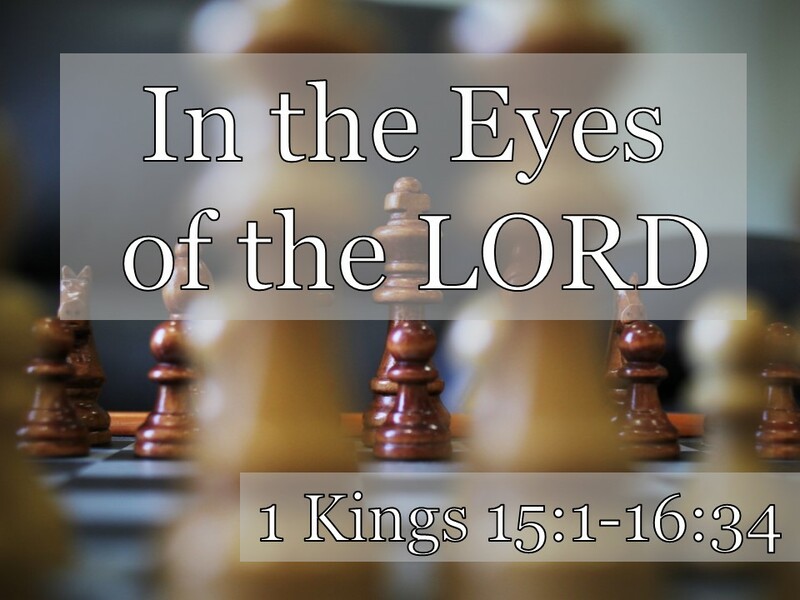 Skim your eyes over 1 Kings 15:25-1 Kings 16:34. Which kings are examples of doing evil in the eyes of the LORD? What did they do that was so bad? What can we learn (negatively) from their examples? 5. What did you pick up from these two chapters about how God thinks and feels about idols? What are modern day idols that people struggle with? What are idols you are tempted to worship? Why? What does it look like, in practical terms, to purge these idols from our lives today? 6. 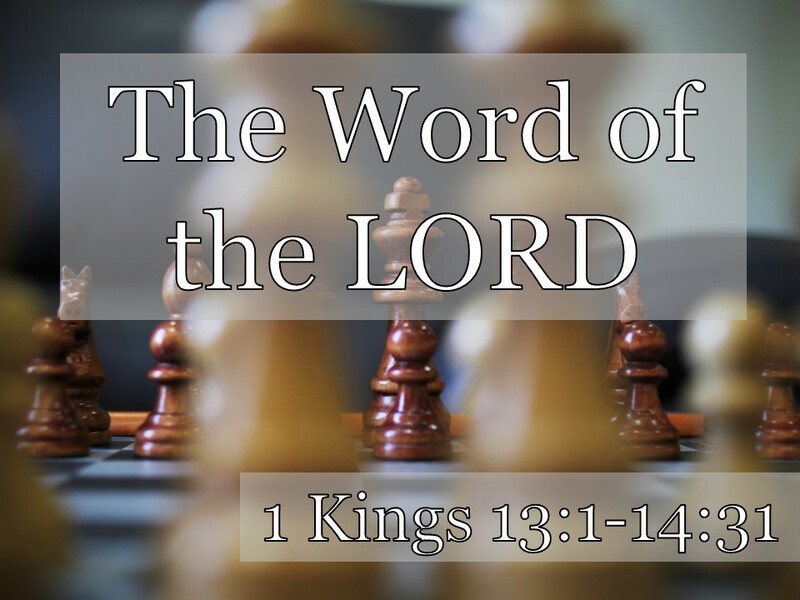 What do we learn about Jesus from 1 Kings 15 and 16? How is He prefigured? 7. What is your biggest takeaway from this “broken record stuck on a sad, sad song” this week? How can we pray for each other? [Matt's Messages] "The Word of the LORD"
Our sermons series is entitled, “The King of Kings in the Books of Kings,” and last week we turned a big corner. 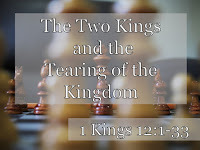 We went from reading about one main king, Solomon, and his one breathtaking kingdom of Israel to now learning about two kings reigning over two kingdoms, Israel and Judah, because the one kingdom had been torn in two. Who is the king in the South, the kingdom of Judah, the son of David, the son of Solomon? Rehoboam. We learned last week that Rehoboam wasn’t very wise. The kingdom tore apart on his first official day on the job! Rehoboam was a thumbs-down king. But God had promised the new king of the northern kingdom of Israel that if he would be like David, even though he wasn’t a son of David, God would bless him like He had blessed David. What was his name? Who was the king in the north? Jeroboam. And was Jeroboam a thumbs-up or a thumbs-down king? He set up false worship. Jeroboam set up golden calves and unauthorized altars to be used in worship in the north. One calf at Dan and the other calf at Bethel. And he set up feast days on whatever day he felt like. And he appointed people as priests who had absolutely no business being priests! Now we had to stop last week at the end of chapter 12. Jeroboam had invented and set up this false worship to keep the people in the northern kingdom. He didn’t want them floating South to Jerusalem to worship, or he might lose their loyalty. It was good marketing. Good politics. But it was terrible worship. And now in chapter 13, we learn what God says about. In chapter 13, God speaks out against Jeroboam. The word of the LORD or the word of Yahweh was what God had said that people should do and what God had said that He would do. What God commanded and what God promised. And that’s the theme that runs through today’s message. What God has commanded and what God has promised. The word of the LORD. And as we learn about the word of the LORD in the Word of the Lord, I think we’ll learn at least three valuable lessons to apply to our own hearts and lives this day. Remember last week that I said it’s going to get complicated and a bit strange as we go along? Well, last week it began to get complicated. This week, it’s going to get a little strange. In fact, it’s quite bizarre. Chapter 13 is full of some strange stories with surprising twists in them. And it even brings up a lot of questions that it doesn’t seem to want to answer. Does that sound interesting? I hope so because here we go. Chapter 13, verse 1. It starts with our key phrase. Stop there. Do you see how this just flows out the last chapter? Jeroboam is right there at Bethel, standing the by the altar, participating in false worship. And God has something to say. Yikes! That’s quite a confrontation isn’t it? And it’s quite a far-reaching prophecy. Anybody want to take a guess how many years are going to pass until this son of David named Josiah will be born? I never realized that until I studied for this week’s sermon. This is an almost 300 year in advance prophecy. It’s the word of the LORD. It’s so dramatic, isn’t it? Like something from Moses and Pharaoh. The sign is that altar will be split. It’s the same words in Hebrew for the tearing of the kingdom. This altar will be altered. This altar will be torn and all of your burnt offerings on it are going to spill to the ground. And it happens right then and right there! Now, here’s where it gets strange. So far, it’s been pretty straightforward even though it’s been very dramatic. Do you have it your mind? There’s a second prophet, an older one. This is older prophet who lives in Bethel where there is a golden calf and an evil altar. How come he hadn’t delivered the prophecy to Jeroboam? And why were his sons present at the altar to hear what went down between Jeroboam and the man of God from Judah? We don’t know, but something doesn’t feel right here. He’s heard all of this and has gone donkey-riding off to see if he can intercept the man of God from Judah. He shouldn’t be able to because there is only 6 miles from Bethel to Judah. This story has taken a turn, hasn’t it? And it’s a turn for the worst. We’ve got here a rogue prophet. A false prophet who is putting words into the LORD’s mouth. #1. THE WORD OF THE LORD SHOULD BE FAITHFULLY SHARED. If we shouldn’t bear false witness against our neighbor, how much more should we be careful what we say that God has said! The man from Judah had shared the word of the LORD faithfully to Jeroboam. But this guy was faking it. This Summer, I’m teaching a preaching class to Hunter and couple of other guys. And every week, we are stressing that what we are doing when we preach is sharing the words of God. And that’s a very high privilege and responsibility! Beware of people who put words into God’s mouth. And they have Him say what they want Him to say. As if they were ventriloquists. Fathers, you have a responsibility to share the word of the LORD faithfully with your children. Dads, it’s part of your job to teach the word of the Lord to your kids. Just like we learned about on Mother's Day, we are to be mission-minded dads who make disciples of our kids. The word of the LORD should be faithfully shared. This prophet was doing the exact opposite. We don’t know why. Perhaps he wanted to keep the man from Judah so that he would somehow bless the northern kingdom. Like Jeroboam did. Maybe he was lonely. Or maybe he wanted to trip the other guy up. But the surprising thing is that...he succeeds. Now the word of the LORD (the REAL word of the LORD) comes onto this old prophet and he proclaims judgment on the man from Judah who had just proclaimed judgment on the king of Israel. And what was his sin? Was it being too trusting? V.21 again. #2. THE WORD OF THE LORD SHOULD NOT BE DEFIED. This man knew what God had said. The word of the LORD had been very clear. And God would have made it very clear again if He was changing His mind in some way. God knows that this prophet was defying the word of the LORD. Now, that doesn’t mean that he was a totally bad man. He had been a good prophet [that day! ], but he had let his guard down. And he’d allowed himself to be misled. And he’d done on a small scale what Jeroboam was doing on a national scale. He defied the word of the LORD. I have so many questions, and the Bible doesn’t want to answer all of them. Why did the lion just stand there? My best guess is to show that this is a miracle. This death was a supernatural judgment, a fulfillment of prophecy, not just a fluke animal attack. That’s what stands out. That’s what should not be! Just because you preach the word of God faithfully does not automatically make you holy or exempt from God’s discipline. Just because I might get the Word right this morning, doesn’t mean that my heart is automatically right. I still can fall. And it doesn’t mean that I am exempt, either. Whatever the word says to you, it says to me. I’m very afraid of preachers who say one thing and do another. I’m afraid for those who enable them. And I’m afraid to become one myself. The same is true for Fathers. Dad’s, you’ve got practice what you preach. Don’t tell your sons and daughters to do one thing and then go against that very thing yourself. You’re unteaching whatever you’ve taught correctly, and you will live with the consequences. He knew what he should have done. Jeroboam knew better, too. Are you defying the word of the Lord? Are there things in your life that you know you should not be doing and yet you are? I’m sure you have good excuses for them. Maybe even an angel told you it was okay. Or a false prophet told you that it was okay. What needs to become holy that is unholy right now? What things are you doing, feeling, believing, saying, thinking that you know better and need to change? It’s easy to point out the sins of others, maybe out in the culture. It’s easy to point fingers at gays or Muslims. But this passage demands that we ask ourselves what we might, ourselves, be doing that is defying the word of LORD. I think that the old prophet shows some repentance here. He realizes that he has done wrong and that God has done something holy here. The man of Judah never gets to be buried in Judah, but where he is buried, this other prophet will be, too. File that away! This burial site will become important again after many many chapters go by in the books of Kings. Because what the man of Judah had prophesied would surely come to pass. #3. THE WORD OF THE LORD WILL CERTAINLY COME TRUE. V.32 again. None of His words fall to the ground. None of them return to Him void. Josiah is a long way off, but he is coming. God always keeps His promises. Including His threats. That’s what chapter 14 is all about. Let’s look at this next story. Verse 1. Do you get the picture? Jeroboam has a son. He’s named him Abijah. He loves him. And Abijah is sick. Looks like he’s going to die. Jeroboam goes looking for some supernatural help from the prophet who had told him that he would be king. But he had also told him that Jeroboam should act like David and obey the LORD and not defy the word of LORD. So he doesn’t think that Mrs. Jeroboam should go as Mrs. Jeroboam. She should disguise herself and Ahijah is blind anyway, so she might get away with it. I love that. You can just imagine the blind guy meeting her at the door and knowing about it. “Go, tell Jeroboam that this is what the LORD, the God of Israel, says: 'I raised you up from among the people and made you a leader over my people Israel. I tore the kingdom away from the house of David and gave it to you, but you have not been like my servant David, who kept my commands and followed me with all his heart, doing only what was right in my eyes. You have done more evil than all who lived before you. You have made for yourself other gods, idols made of metal; you have provoked me to anger and thrust me behind your back. The LORD will raise up for himself a king over Israel who will cut off the family of Jeroboam. This is the day! What? Yes, even now. And the LORD will strike Israel, so that it will be like a reed swaying in the water. He will uproot Israel from this good land that he gave to their forefathers and scatter them beyond the River, because they provoked the LORD to anger by making Asherah poles. The word of the LORD will certainly come true. Here we have the prediction, not just of the abortion of a dynasty but the exile of the entire northern kingdom. It will be many years, but they will experience destruction and have their beloved land taken away from them. That’s important. It’s important to realize that the end and exile of Israel had already been decided with king number one. The word of the LORD should be shared faithfully. The word of the LORD should not be defied. “Then Jeroboam's wife got up and left and went to Tirzah. As soon as she stepped over the threshold of the house, the boy died. They buried him, and all Israel mourned for him, as the LORD had said through his servant the prophet Ahijah. He might have done all kinds of great stuff. He might have been a great dad who played with and taught his sons. And fought wars and ruled well in other areas. But the author of this book says that stuff doesn’t matter very much if he didn’t do his one job of believing and obeying the word of the LORD. His son Nadab succeeds him as king, but you know it’s not going to be for very long. Because the word of the LORD will certainly come true. That’s what happened with Rehoboam. The rest of the chapter closes the story on his life. It shows that even though he was David’s son, he didn’t end well. “Rehoboam son of Solomon was king in [the southern kingdom of] Judah. He was forty-one years old when he became king, and he reigned seventeen years in Jerusalem, the city the LORD had chosen out of all the tribes of Israel in which to put his Name. His mother's name was Naamah; she was an Ammonite. Judah [under the reign of Rehoboam] did evil in the eyes of the LORD. By the sins they committed they stirred up his jealous anger more than their fathers had done. They also set up for themselves high places, sacred stones and Asherah poles on every high hill and under every spreading tree. There were even male shrine prostitutes in the land; the people engaged in all the detestable practices of the nations the LORD had driven out before the Israelites [in the book of Joshua!]. And we’ll pick up there next week. We’ve already closed the books on the next generation after Solomon. And the kingdom is clearly falling apart. There will be moments. There will be moment of grace and glory. But you can see already where this is headed. Because these kings have defied the word of the LORD. They have the word of LORD, but they are rejecting it. When these kings are at their best, they remind us of King Jesus. Jesus loved the word of the LORD. He WAS the word of LORD! King Jesus loved what God had said, trusted God’s promises perfectly, and obeyed God’s commands completely. He was and is all that a King should be. And then He died. He was crucified on the Cross because He took on Himself all of the defiant rebellion that we had committed. And the punishment that we deserved for our defiance, fell on Him. He came back to life just like He said He would do. And He offers eternal life for all who will turn and trust in Him. Twenty-two wonderful years with this beauty! [Matt's Messages] "The Two Kings and the Tearing of the Kingdom"
Has 1 Kings been confusing and complicated to you yet? We’ve gone through the first eleven chapters of this book, and the main character besides the Lord has been King Solomon. His succession to the throne, his building a glorious temple (and dedicating it) and reigning over a breathtaking kingdom that was fulfilling the promises that God had made to Abraham, Isaac, Jacob, and David. And also Solomon’s fall. How Solomon’s heart was turned to idolatry by his idolatrous love of many foreign wives and how God promised him that his glorious kingdom would be torn away from his descendants–at least 80% of it would be. So has 1 Kings been confusing and complicated to you yet? I ask because this book is about to get very complicated and quite weird. Up till now, we’ve basically had one king at a time. Yeah sure, Adonijah made his play for the throne back in chapter 1, but he was quickly defeated, and it’s been all Solomon all the time since then. But today, we read about the tearing of the kingdom. The dividing of the kingdom that the LORD had promised Solomon that He would do as a consequence of Solomon’s failure to do his one job as king of Israel–to walk with God in covenant faithfulness leading the nation to do the same. So now there’s going to be two kingdoms. And there’s going to be two kings. From here to the end of 2 Kings there will be two kingdoms, and there will always be two kings in power. One over each part of the divided kingdom. And some of those kings are going to do fairly well, at least for a time, and others are going to do very very poorly. And there’s a lot of strange stuff that’s going to go down. So, if you’ve been confused so far, hold onto your hat and buckle up your seatbelt, because it’s going to get very complicated from here on out. And yet, it’s also very simple. The details may be abstruse, but the underlying theology is actually very simple. The books of Kings explain theologically what went wrong in Israel. Why did they go from the glorious golden kingdom of Solomon to a divided and disintegrated nation in exile? It’s all about Israel’s failure to keep the covenant. And it’s all about God’s severe yet merciful and faithful relationship with His unfaithful people. And each king whispers to us about King Jesus. When the kings are at their best, they remind us of King Jesus. And when the kings are at their worst, they remind us why we still need King Jesus. Today I’ve only have two points of application to share with you. And I was really encouraged as I thought about them how perfectly they fit for Graduation Sunday. These two points of application are for all of us, but they are especially what I might want to give as counsel to our recent high school graduates as they move into this new phase of life. So listen up closely, Bryce, Aspen, Josh, Nathan, Daniel, and Rachel! I might be calling on you. I’m definitely talking to you! At the end of chapter 11, King Solomon died. He was buried in the city of David, and his son “Rehoboam” was named the king. Chapter 12, verse 1. So, Rehoboam is the king and he’s going to Shechem to become the king. What does that mean? I think it means that he’s going up to Shechem to formalize his kingship especially with the northern tribes. Shechem is where Joshua made his famous, “Choose this day whom you will serve. As for me and my house, we will serve the Lord” speech. And Rehoboam thinks that he should go up to Shechem perhaps to be crowned and also to receive the expression of fealty, loyalty from the heads of the northern tribes. But it goes disastrously wrong. I'm pretty sure that Rehoboam didn’t see this coming! But Jeroboam probably did. Do you remember him? In chapter 11, the prophet Ahijah ripped up his new cloak and handed 10 pieces of it to Jeroboam telling him, from the LORD, that he will one day rule over Israel and his kids will to, if he is a thumbs-up king. Now, normally, this wasn’t supposed to happen. The people weren’t supposed to make demands on the king. This shows that all was not well in the nation of Israel. It had come to this. The people, through Jeroboam, were complaining and requesting a reduction of their labor and heavy taxation. Now, we don’t know if the conditions were really that harsh. People weren’t complaining a couple decades ago when Solomon started his rule. Even though they worked a lot and paid taxes, folks were happy back then. Maybe Solomon got worse as he went along and maybe these folks just didn’t like it and felt like complaining. We don’t know. We do know that they brought these concerns to Rehoboam who was: the son of the wisest man who had ever lived. But Rehoboam? Not so much. He assumes too much and he surrounds himself with yes-men. “Then King Rehoboam consulted the elders who had served his father Solomon during his lifetime. ‘How would you advise me to answer these people?’ he asked. What do you think? Good advice? Makes sense? Yes, his older counselors advise him to become what we would call a servant leader. That’s always a smart move! The young men [who are not dumb. It’s clear now what Rehoboam wants to be told, these younger guys] who had grown up with him replied, ‘Tell these people who have said to you, 'Your father put a heavy yoke on us, but make our yoke lighter'–tell them, 'My little finger is thicker than my father's waist. Rehoboam has a chance here to make a wise choice. Or a foolish one. The choices we make in life have real and lasting consequences. And it really matters whom we are listening to when we go to make them. Torn in two. The nation will never be the same. Rehoboam failed to seek out and love true wisdom. Solomon’s first act as king of the united kingdom of Israel was to pray for true wisdom. His son’s first and only act as king of the united kingdom of Israel was to reject true wisdom. How much better it would have been for Rehoboam if he had heeded his father’s words in the book of Proverbs chapter 4. Bryce, Aspen, Josh, Nathan, Daniel, and Rachel, your search for wisdom should not end with your graduation from high school. If anything, it’s going to be more important now than ever. Because you’re heading out on your own. Rehoboam was graduating from king school to actually being a king. But he was a disaster at seeking out true wisdom. Now, in this story, it is the older folks who are wiser. They have more experience to offer. I think there is something there for you, as well. Seek out wise, mature, seasoned people to mentor you and give you wise counsel for the big decisions you’re going to be facing in the next few years. Let me encourage you to consider your parents in that. After I graduated from high school and went out on my own, my parents got a lot smarter! Actually, they didn’t, but I woke up to just how smart they really were. And this story isn’t teaching that the old folks have all of the wisdom and the young folks are just young and dumb. But it is saying that it’s dumb to surround yourself with foolish people and especially with just your “friends” who are going to tell you only what you want to hear. The wisdom from the older advisers was much better. They told Rehoboam to become a servant leader. Let’s do that. If we are in a position of authority, let’s not ask what our followers can do for us, let’s ask what we can do for our followers. It’s so much easier to follow a man who serves. Pastors, elders, church leaders, serve the flock. And here’s another piece of true wisdom. Don’t miss this. Trust in the mysterious sovereignty of God. Did you catch the theology of verse 15? I kind of read over it fast, let’s go back and look at it. Now, let’s get this right. Rehoboam was fully responsible for his foolish decision. That’s clear. And yet, God was in it, too, working out His sovereign plan. No, it was universe control. This is God’s mysterious sovereignty working EVERYTHING including (and especially!) the bad stuff to His all-wise purposes and ends. The author says that this “turn of events,” this twist in the story of the world came from the LORD. It didn’t take Him by surprise. It was actually part of His plan to use Rehoboam’s foolishness to fulfill Ahijah’s prophecy. And it would be wise for us to try to understand this. His sovereignty is mysterious, but it is true and good. Rehoboam’s foolishness was sad but also controlled and served God’s greater purposes. Can you think of some ways to apply that true wisdom to what’s going on in your life right now? And what others have meant for evil (or have done in stupidity), God works for our good and His glory. Because Rehoboam did not. And it cost him the kingdom. They didn’t like the envoy that Rehoboam sent–I wonder why, I mean he was the guy who had used to force them into labor. Oh wait. That’s probably why. But Rehoboam lives to rule and make foolish mistakes another day. “When all the Israelites heard that Jeroboam had returned, they sent and called him to the assembly and made him king over all Israel. Only the tribe of Judah remained loyal to the house of David. When Rehoboam arrived in Jerusalem, he mustered the whole house of Judah and the tribe of Benjamin–a hundred and eighty thousand fighting men–to make war against the house of Israel and to regain the kingdom for Rehoboam son of Solomon. That’s the wisest thing that Rehoboam ever does, right there. He doesn’t go try to fight against God’s will. He backs down from this fight, at least for now. And he sends the troops home. So that leaves Jeroboam king in the north. What kind of a king do you think he is going to be? We’ve already seen that Rehoboam is a two-thumbs down guy. How about Jeroboam? God has handpicked him to lead the northern kingdom and promised him that if he is a thumbs-up king who walks with God and leads the nation to do it, too, then he will have a great dynasty and be blessed like David was. Which way does he go? In fact, he becomes like the quintessential thumbs-down guy. The by-word. The poster boy for thumbs down kings. And how does he do it? He does it by rejecting true worship. You see what he’s worried about? You can tell he’s worried because he’s talking to himself. He’s worried that he’s got a bunch of Israelites on his hands. And where do they worship? Jerusalem! At the big golden temple! And what if they keep going down there to worship (like the Law says)? Eventually their worship will lead them back to the house of David. So what does Jeroboam do? He asks God to continue to protect his new kingdom from the threats of true worship? “After seeking advice [but apparently not good advice], the king made two golden calves. He said to the people, ‘It is too much for you to go up to Jerusalem. Here are your gods, O Israel, who brought you up out of Egypt.’ One he set up in Bethel [in the south], and the other in Dan [in the north]. If you’ve been in our Sunday School classes, you’ve just recently finished Aaron setting up a golden calf. And they are at places where worship has gone on before. Jacob worshiped at Bethel. It was the house of God! And there was worship in Dan during the book of Judges. But that’s not where true worship was supposed to be. But it’s just to keep them loyal customers. That’s the biggest understatement of the chapter 12. I don’t know how many times the books of Kings does this one thing get repeated. Jeroboam led Israel to sin with these golden calves. He might have been pretending that they would only serve to enhance true worship of Yahweh. But that was not their true purpose nor their result. He only had one job, but Jeroboam failed his one job. For our graduates and for all of us. Seek out what is true. And don’t worship what is false. Jeroboam basically invented his own religion and customized his own god. He just went out on his own and made it all up. It would be genius if weren’t so wicked. But don’t we do that today, as well? Not that most people go out and start our own religions. It’s normally a little more subtle than that. Instead of saying, “The one true God is like this....” and worshiping Him as He is. One time I was helping this one lady, and it’s always stuck with me, I’ve told this story before, and I was inviting her to church here with us. We don’t get to invent our own religion. We find out what is true and then worship God as He really is. Not as we would have Him to be. It’s wonderful that He is wonderful in every way. But He is who He is, and we don’t get to decide. I love that Jesus says that God is seeking true worshipers. Has he found one in you? Bryce, Aspen, Josh, Nathan, Daniel, and Rachel, have you come to know the One True God and Jesus Christ Whom He has sent? If so, worship Him in truth! Find out Who He is and worship Him as He is. We just gave you a big honkin’ Bible. It’s the NIV Zondervan Study Bible. And it comes with a download code to get all of that this good stuff on your smartphone. Use it. Dig into it. Find out what is true. Don’t invent your own a god. For example, a god who is not holy or angry at sin. Or a god that tells you only what you want to hear. That’s what the world does. The world customizes God and shrinks Him down to a manageable size. But God will not be managed. That’s as far as we’re going to get today. We’ll learn more next week about where these golden calves take Jeroboam, but you know that it’s not going to be good. Because God is god alone and He wants to be worshiped in spirit and in truth. Bryce, Aspen, Josh, Nathan, Daniel, and Rachel, don’t stop going to church now that you’ve graduated. It’s easy to start skipping out on biblical community and worship when nobody is making you, but it will hurt you. Here’s where these two kings went wrong. Rehoboam rejected true wisdom and Jeroboam rejected true worship. And kingdom was tragically torn apart. May we do the exact opposite and see Jesus’ kingdom built in us. It would be very difficult to overestimate the positive influence of Wallace Kephart in my life over the last two decades. The Lord has used Wally in countless ways to encourage, challenge, support, and shape me. I can’t imagine what my life and ministry would be like if God had not intersected our two paths. Wally’s influence on me began before I had ever heard his name. In the early 1990's Wally sat on the Board of Regents of Trinity Evangelical Divinity School (TEDS), my alma mater. By serving on that board, he helped to forge, shape, and protect the first-rate seminary education which prepared me theologically to be a pastor in the Evangelical Free Church of America (EFCA). And he had also formed a friendship with both the director of placement at Trinity and the district superintendent of the EFCA’s Allegheny District, so that when I was looking for my first pastorate and Lanse EFC was looking for their next pastor, Wally already had the relationships in place to build that bridge. Wally was the chairman of the search committee that invited me to candidate at Lanse Free Church in the spring of 1998. I still have a file of printed-out emails that we exchanged during that time. How exciting! Each conversation led us closer to the eventual call. We both saw the Lord’s hand guiding every step of the process. And we prayed for each other using this relatively new medium of email. I sent prayer requests for term papers and final exams. Wally sent me lists of men that he was praying for to become disciples of Jesus Christ. Some of those men are now leaders in our church! We’re still praying for others together. Heather and I stayed at Wally and Nesta’s that candidating weekend, and they showed us around central Pennsylvania. One morning, he woke us up early and took us out to Blue Knob to join the youth group on their spring retreat. While Heather napped in the backseat of the Aurora and we crested Sandy Ridge, Wally began sharing with me the details of all of the difficult struggles that the church had gone through over the last ten years of its history. He didn’t want there to be any painful surprises after I became the pastor. I was so encouraged by his transparency and clearly evident care for the church family and their prospective pastor. 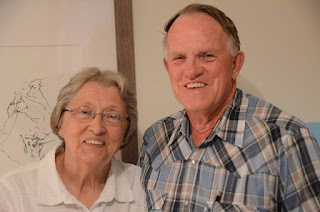 After I was called to pastor the church, Wally agreed to be the church chairman for the next full year and then allowed himself to be re-elected two more years just so that I would have continuity and faithful support at the top leadership level as I found my feet as a rookie pastor. Wally also got me involved in the broader EFCA right away. He encouraged the church family to make it a part of my job description to be credentialed and to attend district and national conferences. In fact, Wally and Nesta took us to our first national conference in Albuquerque just two weeks after the start of my ministry! Wally is a big part of the reason that I am so heavily involved in the EFCA today. And if those initial things were all that he ever did, I would be forever in Wally’s debt because the foundation we laid then still stands 18 years later. But that’s not all he ever did for me! 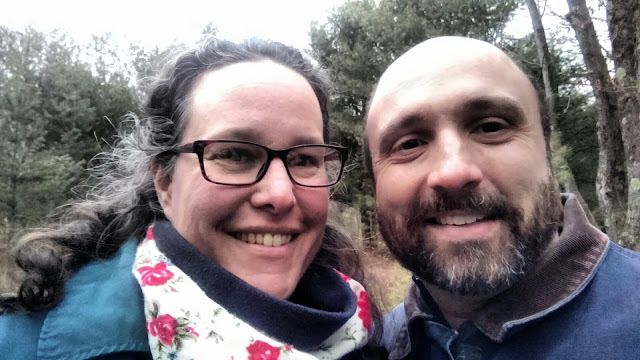 Wally has continued to faithfully minister alongside me, to support me in innumerable ways, and to challenge and encourage me to follow Jesus Christ with all of my heart, soul, mind, and strength. I’m pretty sure that after eighteen years now, I’ve been his pastor longer than any other pastor he ever had in the last eighty. But he’s also been a pastor to me this whole time. Wally is a man who is driven. He’s always looking for more. More growth, more disciples, more development, more prayer, more giving, more blessing. He never lacks in vision. In eighteen years, I’ve never gotten ahead of him in wanting more for Lanse Free Church. I often lag or drag behind! His desire for more hasn’t grown less with age even as he’s begun to slow down some. But it’s not a desire for more glory to him. He’s always looking out for the good of others and especially for glory to his Lord. And he doesn’t try to achieve all of this on his own power but by abiding in Jesus because without Him we can do nothing (John 15:5). Wally is not naive. In addition to the silver lining, he can also quickly identify the down-sides and problems going on around him. But he doesn’t let those negatives capture his focus. He brings a potential solution to every problem, and he believes that God will turn things around in His good timing. For many years, long before I entered my D.Min program at Westminster Theological Seminary, Wally took to playfully calling me, “Doctor Mitchell.” He could see that it encouraged me, and I think he could see my future–that I would eventually get my doctorate. His positivity certainly helped make it happen! Wally never stops acquiring knowledge and skills. You might think that he would eventually take a break and rest on his laurels, but he continues to get out his Bible at church, to attend Sunday School, to go to a men’s Bible study, to read good books, to listen to teaching on the radio and television. Every week at church, he tells me a story of something he learned over the last seven days. And it’s not just spiritual things. He’s always developing a new ability or new understanding of how things work in fields like mechanics, engineering, or communications. Did you know that Wally believes that you can’t out-give God? I’m sure you’ve heard him say it! Wally has learned through experience that God loves (and blesses!) a cheerful giver. Time after time, I’ve been the recipient of Wally’s generosity, especially of his time and expertise. When we were building our house, Wally let me set up my doors and cabinets in his garage to paint and stain for weeks on end! He’s been at our house running a tractor to plant a lawn. He’s loaned us cars and equipment. He’s given me hours of counsel on various problems that I’ve had to solve. And he never complains; he just gives. If that’s true for me, how much more is it true for Lanse Free Church. I doubt that the hours of service that Wally has put in could be counted up. He’s driven and fixed buses. He’s sat on boards and committees. He’s kept our lawn mowers running. He’s shown up early and left late. I don’t know how many bags of trash I’ve seen him tie up and carry out to the dumpster. I remember when he was about seventy, finding him on his knees laying cement down to level a floor in an office. He never stops giving. Wally has also influenced our church family to be generous. He always sees worthy projects, missions organizations and ministries in which we could be involved. So many churches have an inward focus, but due in part to Wally’s influence, our church is always giving to others. And you know what we’ve learned? You can’t out-give God! Wally prays. He doesn’t just say that he’s going to pray for you; he prays for you. And he is a champion for prayer and prayer meetings. I’ve been to more than one thousand prayer meetings with him since 1998 and maybe as many as two thousand when you count them all up. When I first came as pastor, Wally suggested that a few leaders meet to pray with me before Sunday School gets rolling every week. That weekly prayer meeting continues today. Last year, he started an extra monthly “Harvest Prayer Time” to pray for those folks in our spheres of influence that need to trust Jesus as their Lord and Savior. Just last Sunday, he challenged the entire church family to personally pray five minutes every day for loved ones who need the Lord in their lives. Prayer never goes stale with Wally. He is always looking for the leading of the Holy Spirit. Sometimes Wally and I disagree. We don’t share the same perspective on every single thing, but even when we’re on opposite sides of an issue, I always know that Wally is for me. He’s always looking out for my best interests. Through thick and thin, Wally sticks with his family, his friends, his church family, and his association of churches. His loyalty is not blind, but it is steadfast. He lives out the love of 1 Corinthians 13, “It always protects, always trusts, always hopes, always perseveres” (v.7). Wally could never get involved in politics because he is such a straight arrow. He couldn’t run for office because he doesn’t know how to lie. Wally is a straight-shooter and always tells you how it is. He can be kind of blunt sometimes; however, the Bible says “Wounds from a friend can be trusted, but an enemy multiplies kisses” (Proverbs 27:6). You don’t have to worry about not really knowing where you stand with Wally, and he’s committed to trying to get on the same side of the problem as you. You knew this one was going to be last. Wally has a heart for the gospel. He wants people to know Jesus Christ as their Lord and Savior. He knows that God desires for people to not perish but to come to repentance, so he goes after them with the good news. He is focused on reaching men, especially businessmen like himself, to trust in Jesus with all their heart and lean not on their own understanding but in all their ways submit to him so that he would make their paths straight (Proverbs 3:5-6). The thing that Wally cares about the most is that the people he cares about the most know the Savior that he cares about the most. Nothing would please Wally more than to know that he had a part in you coming to know Jesus yourself. I could go on and on, but you can see how I’ve been blessed by knowing Wallace Kephart. I’m thankful for the last eighteen years of his eighty, and I look forward to being his pastor and friend for as long as the Lord will give us. On Sundays after church, Wally always shakes my hand on the way out of the worship service and says, “God bless you, Buddy.” And that’s what I say back to him today on the occasion of his eightieth birthday. Wally, you’ve been a blessing to so many, especially to me. God bless you, Buddy!